Announcement And we're back! It's been some time but we're back and better than ever! Brand new products, refined staple products you know and love, and more to come! #NatureLoversUnite! Coming back to the store soon you'll find mason jar herb garden kits with organic soil or hydroponics which are perfect for first-time gardeners. In stock items ship within 1-2 business days and include directions. Grow your favorite herbs from seeds and never buy and throw away store bought again. Clip and use fresh whenever you need some delicious flavor or to combat a cold! No store can compete with something you've grown yourself. -*Due to the natural source of the pebbles, colors, shapes and size may vary. And we're back! It's been some time but we're back and better than ever! Brand new products, refined staple products you know and love, and more to come! #NatureLoversUnite! Easy to use and herbs are growing beautifully! The order was shipped earlier than expected and the unique packaging was great. The instructions were very clear and simple and it only took a few minutes to put it together and they look great. It's a great buy for the price. I'm hoping the herbs grow soon! Very well packaged, carefully designed and has clear directions. My basil has sprouted! I love growing lettuce in these kits. This one had a bit of a trim. Aromatic fresh basil. Plenty for some pesto! Oregano in the soil kit. I love adding oregano to my pizza. I always wanted to garden but I couldn't keep a plant alive to save my life! One day, my complete neglect of a plant for a couple weeks showed signs of survival and prosperity. I had no idea how it survived but after seeing it bear over 20 fruits I had to figure out how and was hooked. I watched videos, read articles and books, and experimented (which was the most fun)! Through trial and error and research, I found a great way to grow herbs indoors using a mason jar. Around the same time I found out about hydroponics and wondered if the same idea would work. Turns out it worked out amazingly well and my business was born. I wanted others to experiment with me and enjoy this crazy phenomenon of urban gardening, especially those of you out there with "black thumbs". But I also want it to be a stylish, low maintenance, recyclable planter! Now, in 2019, it has grown into much more than that, but still a love of gardening and nature. My creative muscles have been flexed and my mind has been opened to this world of plants and nature and it's a beautiful thing. I created my dream job by starting what is now Coco and Seed. I enjoy urban gardening, designing and I'm a huge tea lover. I also love the small business community and connecting with other business owners. Thank you for visiting my Etsy site. I make nature and garden inspired products. 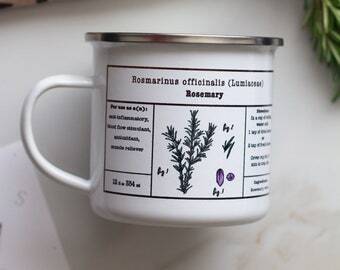 Everything from hand drawn illustrated sturdy enamel mugs, to small indoor hydroponic garden kits perfect for the beginner gardener. If you have any questions, please send them my way! I'd be happy to help! Domestic Returns are accepted within 14 days. Please contact to notify me if you want to return or exchange your garden kit. Exchanges are accepted if the product has not been used and is in "new" condition. International: Sorry, returns will not be accepted at this time. If you need it exchanged you will be responsible for shipping. Please contact to notify me if you want to exchange your garden kit. However, if you are unhappy with it please let me know and a refund can be arranged. Please inspect all contents upon acceptance of your package and notify me within 48 hours of any damages. Buyer is responsible for shipping costs for returning items. I accept direct checkout and PayPal as payment options. You do *not* need to have a paypal account to use PayPal as a method of purchasing. All packages are sent via USPS using priority or first class mail. Each kit is checked and packaged with care before delivery. It is expected that your garden kit arrive in perfect/non broken condition. The jars are made of heavy duty glass and is packaged well. If your glass is damaged upon delivery please notify me asap! PLEASE NOTE that due to certain country policies sending seeds may NOT be an option. In that case you would need to provide your own seeds from your local nursery or market. In this case where seeds cannot be sent, an extra pack of nutrients will be sent in it's place. Please send me a convo for any questions! Please note that International orders outside of the United States may be liable for customs fees. I do not cover the customs charges as each country is different. If your package is needed sooner please send me a message with what you are looking for! Make sure to give your plants enough time to grow. If after two weeks you do not see any results please contact me by emailing questions or concerns to hello [!at] cocoandseed.com and we can try to evaluate the situation. Do make sure the seeds in the growing medium isn't soaking wet or completely dry (they won't grow in either condition), it should be just slightly moist. Regularly monitor the soil or grow pod during the seedlings growth period.